Araps campground world received a bit of a shake-up more recently when out of the blue, a new sign appeared with new campsite fees. There had been no pre emptive explanation and indeed, no accompanying explanation. The new fees $15.00 per night per campsite (6 people including 1 vehicle) was a vast difference from the usual $2.00 per person per night. And to put it midly, it didn’t go down at all well with the campers. They were in fact, not happy campers! A number of people quickly got onto the task at hand and spread the word about the fee structure. Social media and online forums got the word out there with instant feedback. While forums can give you the veritable s***s, they are great for getting information out there and this was no exception. The climbing community rallied and sent letters and emails of complaint and better solutions to Parks Victoria. What eventuated was a fast moving resolution due to all those in the climbing community who put their feelings forward so eloquently and to fast moving local PV staff who saw the issue from the start, listened and went in with full support to work with the issues and the legalities at hand. Their response was a direct result of the climbing community’s interaction. By the time I returned to Australia, much work had been undertaken by local PV staff in response to the community feedback. 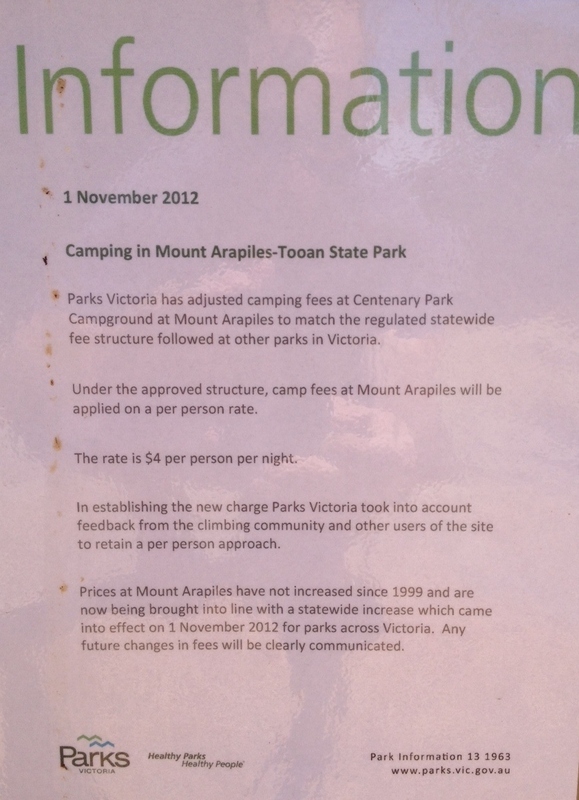 Mt Arapiles falls under the same fee structure as all other parks in Victoria. While this blanket approach may work for a great number of parks, there are others where the uses are more specific and the demographic that uses the campground is at odds with this across the board fee structure. The campground had been enjoying a $2.00 per person per night fee since the 1990’s when on ground staff realized that the pro rata system was a much fairer and more successful way of ensuring that camping fees were paid. Unfortunately, this wasn’t in line with the National Parks Act fee schedule that applied to Mt Arapiles as part of the group of parks it belonged tog and the change was implemented to bring it back into line. The lack of communication with the user group at Arapiles in this situation was disappointing especially considering the close role it has had in helping to look after the parks interests. Following the issue brought to notice however, it was encouraging to see the speed in which Parks Victoria took on board the feedback and set in place actions to separate Mt Arapiles from the park grouping it existed in. Policies have now been set in place so that it has its own unique fee system that operates on a per person/pro rata system. At $4.00 per person per night, this is a much fairer system. There has been a slight increase in the camping fee to bring it into line with the statewide yearly fee increase but considering that there has been none at the park since 1999, I think this is a fair call and one that users are agreeable to. • Infrastructure costs for the bore water for the toilet block. (The bore recently had to be replaced). • Rubbish collection costs. (Usually weekly but often required daily over busy periods). • Grading the roads around Mount Arapiles State Park. • Managing risks associated with ageing pine trees to ensure limbs do not fall on campers. It is in climbers and campers best interests to support the fee charges at the campground. There will be a step up in park patrol over time to check on fee compliance and this should help to further cement the fact that the per person per night fee structure really does work at a campground like Mt Arapiles. Great work by climbing community members bringing the issue to notice, and for generating interest to respond, amongst the community. I feel that lessons have been learned from both sides and I’m sure that this will help inform future discussions. The fact that the resolution was as speedy as it was, is a brilliant outcome! And that speaks volumes I think. As many of us know and agree, Arapiles has a very specific demographic with specific usage requirements and needs and this result has now highlighted that officially. A great collaboration between the climbing community and Parks Victoria and one that hopefully continues to grow stronger. This entry was posted in Access &Environment officer reports, Arapiles, Parks Victoria updates & info and tagged arapiles, parks victoria, rules and regulations by Tracey. Bookmark the permalink.